Gilles Cachemaille, baritone – Gerd Türk, tenor – Monika Frimmer, soprano – et al. 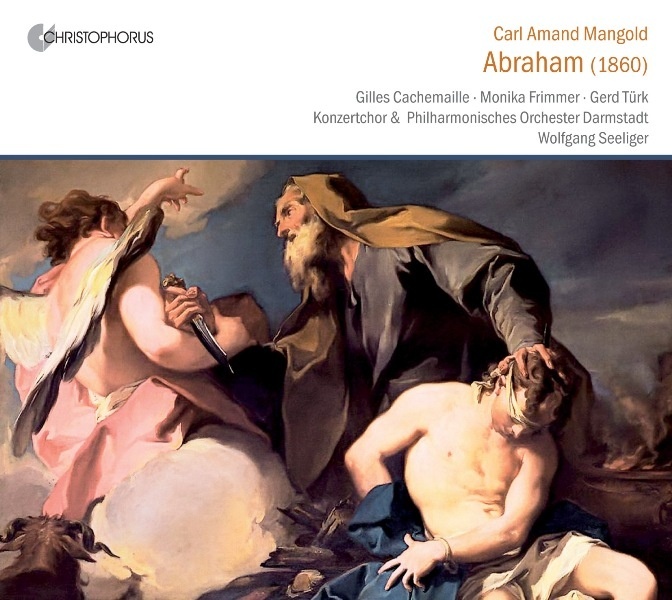 Carl Amand Mangold (1813-1889) was born in the same year as Giuseppe Verdi and Richard Wagner and came from a family of musicians, resident in Darmstadt, South Germany. The Darmstadt Musical Society provided Mangold with the foundation for his Oratorio Concerts, in which he was able to perform compositions created by himself and others. In the era of musical Romanticism, the oratorio flourished again under changed conditions. This genre, which was formerly connected to the religious sphere, had liberated itself from the ecclesiastical context in the 19th century and taken over the concert halls. It had become a component of the bourgeois cultivation of music, prepared to join forces with new themes. The oratory Abraham aroused in the years 1859/60, the text was written by the composer himself “according to the words of the Holy Bible”. As there is no provision for a narrator, the words from the Bible are placed in the mouths of the dramatic persons, when they “speak” to each other. If the dialogue is sketched out in the Bible, then it is used word for word.